Sean McGee as Jimmy, Dylan Godwin as The Lecturer and Ensemble. Photo by Christian Brown, courtesy of Theatre Under The Stars. Hands up those of you that have had the misfortune of being the only sober person in a room full of dope smokers? Sure it’s great fun to watch them giggle and eat chips and trail off while being sure they’ve come up with the next great bread slicing invention for a time. But the novelty does wear off and then all you’re left with is a bunch of stoners. Thankfully for the audience at Reefer Madness, the musical comedy that spoofs the 1936 educational (and now cult classic) film made to showcase the negative consequences of smoking marijuana, watching a bunch of pot-heads at the theater proves decidedly more entertaining than not. On a stage adorned with 1930’s scare tactic posters foretelling all the life-ruining dangers of marijuana, the play opens with a pin-stripe suited Lecturer (Dylan Godwin) warning the audience that the only way to safeguard our children from destruction is keep them away from the dope. In case his words aren’t compelling enough, he presents to us the story of the once clean-cut and promising teen, Jimmy Harper (Sean McGee) and his girlfriend, Mary Lane (Taylor Beyer) as evidence of his caution. Reminiscent of The Rocky Horror Picture Show, another cult classic story, Reefer Madness sends two square as all get up teen sweethearts in to the hands of depravity. There are no bisexual transvestites here though. Instead the danger is something far more earthly. As the eponymous and cutely ominous opening number, ‘Reefer Madness’ suggests, smoking weed is akin to turning into zombie-like psychopaths a la Michael Jackson’s ‘Thriller’ video. We’re not talking only heavy use here either. Wanting to learn how to dance in order to impress his new girlfriend Mary, Jimmy is naively seduced into the world of drugs by Jack Stone (Nick Henderson) a pusher who seems the epitome of cool. Jimmy is lured back to Jack’s dope den, run by his abused and addicted girlfriend, Mae (Kristin Warren) and populated by the now dope insane former college student, Ralph (Mark Ivy) and the over sexed doper Sally (Brooke Wilson) who keeps forgetting she has a baby. Riffing on the notion that trying pot just once and total addiction are fundamentally entwined strands on our DNA, Jimmy is just one puff away from total destruction. It’s about a quarter of the way through the first act when the number ‘Jimmy Takes a Hit’ is performed with full-out hallucinogenic grandeur including visions of orgies, belly dancers and inexplicably a goat. What follows comprises the rest of the show. Jimmy is hooked and headed for real disaster, Mary is worried and vulnerable, Jack wants to keep growing his dope business at all costs, Mae wants out but can’t give up the dope, Ralph is one step away from utter madness, Sally just wants to smoke and hump and the Lecturer pops in an out to make sure we’re still paying frightened attention. 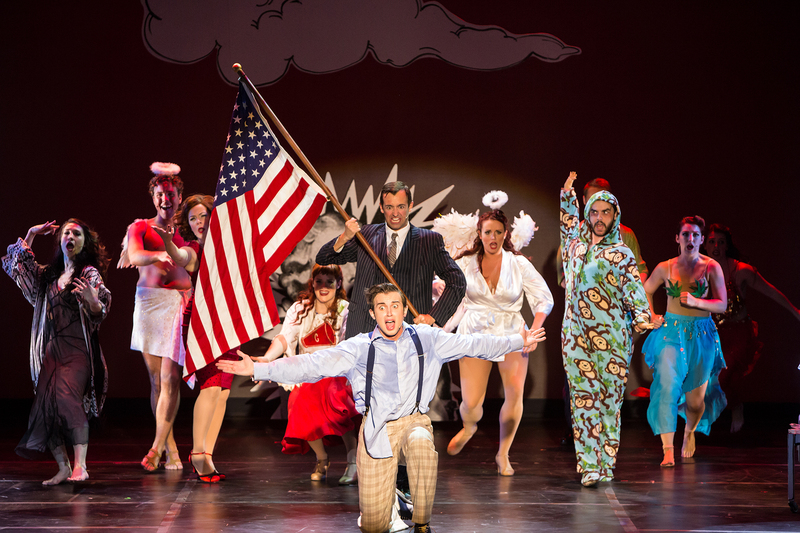 Bruce Lumpkin’s direction and Dana Lewis’ choreography play up the camp of the twenty musical numbers with obvious glee and the talented cast is more than game for the ridiculous portrayals. The music itself is boppy and bright and ironically in defiance of the scourge it depicts. Ryan McGettigan’s set design, employing illustrated black and white askew cut-outs of doors, couches, windows, stairs and even a piano and soda shop bar are in smart but simple contrast to the insanity that going on around it. But by the time intermission comes, the ravings and psychotic physical spasms of the dope fiends tend to wear a little thin. As does a narrative that while always able to find its way back to an amusing moment, feels overly repetitive in places and padded in others. This isn’t Pinter after all. We know where the story is going save for some hilariously gruesome late show developments. It’s ok to take us there faster. In fact, it would have been better to. But then I suppose who has ever been successful at goading a doper into quicker action? Never mind….pass the chips.